Tibial shaft fractures are often the result of the high-energy injury. Sometimes they can also be insidious in onset, such as stress fractures. Motor vehicles, snowmobiles, and motorcycles, as well as the growing popularity of extreme sports, contribute to the increasing occurrence of tibial shaft fractures. The tibia is currently the most commonly fractured long bone in the body. The average age of patients with tibial shaft fractures is approximately 37 years. The highest incidence is found in teenage males. The tibia is a unique anatomical structure. Its anteromedial surface is entirely subcutaneous prone to injury. The location, morphology, and degree of displacement of the fracture has a marked influence on the outcome of the fracture. 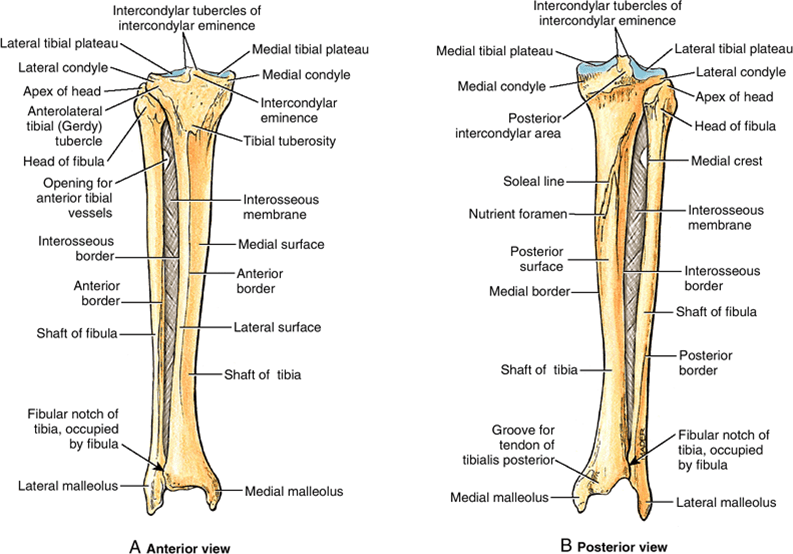 The shaft of the tibia has three borders and three surfaces; anterior, posterior and lateral. The distal end of the tibia also widens and on the medial side ends in a projection called medial malleolus which forms part of the ankle joint. On the posterior surface of the tibia, there is a groove where the tibialis posterior muscle attaches. Laterally, on the distal end, there is a notch, where the fibula is bound to the tibia. It is known as the fibular notch. The leg is divided into four distinct fascial compartments. The anterior compartment contains the dorsiflexors of the foot, including the tibialis anterior, the extensor digitorum longus, the extensor hallucis, and the peroneus tertius. It contains deep peroneal nerve. The anterior tibial artery is the major source of blood supply. The lateral compartment contains the everters of the foot [ the peroneus longus and the peroneus brevis]. It contains superficial peroneal nerve. The leg has two posterior compartments – superficial and deep. The deep compartment contains the tibialis posterior, the flexor hallucis longus, and the flexor digitorum longus. It also contains the posterior tibial artery. Peroneal artery also courses through. The morphology of the fracture will suggest the nature of injury behind. A tibial shaft fracture could be transverse, short oblique, or spiral depending on the trauma causing it. The fracture could be displaced or undisplaced. Transverse and short oblique fractures, unless associated with a pathological lesion in the bone, are indicative of a more severe force than are spiral fractures. Marked comminution and gross displacement often accompany. Fractures of the proximal third of tibia are discussed separately. Tibial shaft fractures can be low energy or high energy. high energy fracture pattern are caused by direct forces resulting in a wedge or short oblique fracture and sometimes significant comminution. The fibula is fractured at the same level. It is associated with severe soft tissue injury. The presence or absence of other injuries in the same limb will greatly affect the natural history of a tibial fracture. For example, fractures of the pelvis and acetabulum may require long-term bed rest, making early weight bearing impossible. Excessive skin contusion, crushed skin or destruction of muscle, subcutaneous degloving, acute compartment syndrome, and rupture of a major blood vessel or nerve. The significant injury would result in swelling and deformity. Often the pain is severe. There would be a visible malformation of the leg are in case of displaced fractures present. Undisplaced or partial fractures may be less characteristic in the presentation. Tibial shaft fractures without fibula fractures present with lesser deformities than those with fibula fractured. A patient stress fracture presents with pain on weight bearing, often with an antecedent change in lifestyle or an increase in physical activity. The pain is classically worse with weight-bearing exercise and improves with rest. The injured should be examined completely to look for concomitant injuries. The leg should be examined for the extent of the injury. Ipsilateral knee and ankle joint should be assessed for injury. Deformity, angulation, and malrotation should be noted. Contusions, blisters and open wounds must be accounted. Compartment syndrome evaluation may be done if required. The particular care is taken to assess any open wounds or color changes that may indicate a more serious injury. The distal neuro-vascular examination should be done and compared to the opposite side. For surgery, a complete blood count, chemistry panel, and a type and crossmatch should be done, along with any other tests in the hospital protocol. Calcium and phosphorus levels in metabolic or endocrine causes may be done for the decreased bone density related to the fracture if the fracture occurs without significant trauma. Full length anteroposterior and lateral views of the affected tibia are done. AP, lateral and oblique views of ipsilateral knee and ankle are also done to rule out/confirm the involvement of the joint. CT is useful to evaluate intra-articular fracture extension. It defines the fracture pattern better. It could be also used to find stress fracture suspected clinically but not visible on x-ray. A bone scan can provide evidence of a stress fracture. Used in case of vascular compromise. Most closed tibial fractures can be treated nonoperatively. Operative fixation is required when fractures are unstable. Open fractures and fractures with vascular injuries are surgical emergencies. The fracture should be aligned and an above-knee padded plaster is applied. The patient should be observed and closely monitored for compartment syndrome. Once the initial phase of the injury is over, the patient is encouraged to stand upright and begin weight-bearing as much as it can be tolerated. Full weight bearing is usually achieved by 7-14th day. Depending on the type of fracture present, the above-knee cast may be converted to a below-knee patellar-bearing plaster or to a functional cast brace between the fourth and eighth week. Fractures close to the knee joint or with intact fibula should be left in left in an above-knee plaster only. The patient must be carefully monitored throughout the treatment phase. If, however, the patient arrives late, or surgery is delayed beyond 8–24 h after injury, the extremity may become very swollen and the skin contusions, with areas of fracture blisters and, it is best to delay surgery until the skin has recovered enough. Amputation is uncommon but is sometimes indicated for severe tibial fractures with significant soft tissue trauma and warm ischemia > 6 hrs. A non-salvageable concomitant foot injury is also an indication. The motion of the extremity may be started to be started early if the fixation is good. For immobilization, the leg should be elevated with the ankle splinted at 95° dorsiflexion. The splint may be removed after 48-72 hours and then applied intermittently especially in the night to prevent plantar flexion deformity or at least 2–3 weeks following injury. Connelly CL, Bucknall V, Jenkins PJ, Court-Brown CM, McQueen MM, Biant LC. Outcome at 12 to 22 years of 1502 tibial shaft fractures. Bone Joint J. 2014 Oct. 96-B(10):1370-7. Heyworth BE, Green DW. Lower extremity stress fractures in pediatric and adolescent athletes. Curr Opin Pediatr. 2008 Feb. 20(1):58-61. Littenberg B, Weinstein LP, McCarren M, et al. Closed fractures of the tibial shaft. A meta-analysis of three methods of treatment. J Bone Joint Surg Am. 1998 Feb. 80(2):174-83. Kindsfater K, Jonassen EA. Osteomyelitis in grade II and III open tibia fractures with late debridement. J Orthop Trauma. 1995 Apr. 9(2):121-7. Ma CH, Tu YK, Yeh JH, Yang SC, Wu CH. Using external and internal locking plates in a two-stage protocol for the treatment of segmental tibial fractures. J Trauma. 2011 Sep. 71(3):614-9. Lefaivre KA, Guy P, Chan H, Blachut PA. Long-term follow-up of tibial shaft fractures treated with intramedullary nailing. J Orthop Trauma. 2008 Sep. 22(8):525-9. Busse JW, Morton E, Lacchetti C, Guyatt GH, Bhandari M. Current management of tibial shaft fractures: a survey of 450 Canadian orthopedic trauma surgeons. Acta Orthop. 2008 Oct. 79(5):689-94. Court-Brown CM, Will E, Christie J, McQueen MM. Reamed or unreamed nailing for closed tibial fractures. A prospective study in Tscherne C1 fractures. J Bone Joint Surg Br. 1996 Jul. 78(4):580-3. Coles CP, Gross M. Closed tibial shaft fractures: management and treatment complications. A review of the prospective literature. Can J Surg. 2000 Aug. 43(4):256-62.